Cultural Difference is a work in progress that was begun in 2004. 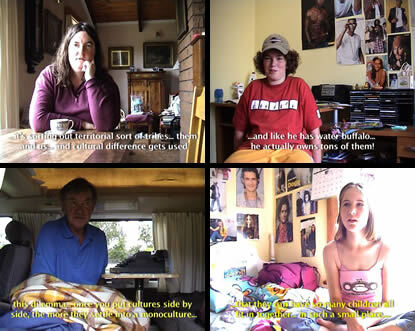 It is an ongoing quasi-documentary video work that puts the term ‘cultural difference’ and its usage – use, misuse and abuse – under the vernacular microscope through a series of personal interviews. A number of individuals explore the term through a process of self-interrogation and reflection in relation to personal experience, and social and cultural enquiry.